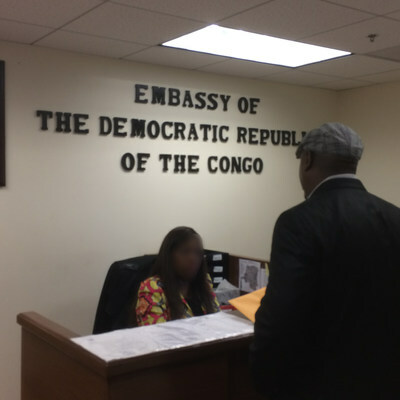 WASHINGTON, Dec. 13, 2016 /PRNewswire/ — Yesterday, at the office of Ambassador François Nkuna Balumuene in Washington, DC, American veteran Darryl Lewis delivered his legal complaint in his suit for torture against two individuals with high-ranking law-enforcement positions in the Democratic Republic of the Congo. According to the complaint, Mr. Lewis was tortured while working in the Democratic Republic of the Congo as an unarmed advisor to former Katanga Governor Moise Katumbi earlier this year. The complaint states that he was illegally detained for six weeks without being charged with a crime, and that while detained, he was interrogated for up to 16 hours a day, threatened, beaten, scarcely fed, and denied necessities for basic hygiene. The complaint was also delivered to the two individual defendants in Kinshasa, the capital of the DRC, earlier today. The case is pending in the United States District Court for the District of Columbia. In his complaint, Mr. Lewis is seeking not less than $4.5 million in damages. NOTE: These materials are distributed by DCI Group AZ, L.L.C. for Akin Gump Straus Hauer and Feld LLP on behalf of Moise Katumbi, and additional information is on file with the Department of Justice, Washington, DC.